This week’s album came out a couple of months ago. When most of you think of Shawn Mullins, you think of his smash hit from 1998 “Lullaby.” Soul’s Core is still one of my favorite albums. A side story about Soul’s Core: The Mad Fishicist and I went to Valdez before he moved there to visit Belle Etoile. We quickly discovered that on a rainy, windy, cold, early fall day, there isn’t much to do in Valdez, Alaska. We spent the day going from one place to the next avoiding the rain…we got the Valdez library tour, watched the earthquake video and most of the pipeline video, watched millions of pink salmon dying for fresh water, and visited the Valdez music store. We bought, or I bought, or he bought two tapes. Yes, casette tapes. One of the two was Soul’s Core and the other was Depeche Mode’s Ultra, or was it Songs of Faith and Devotion? 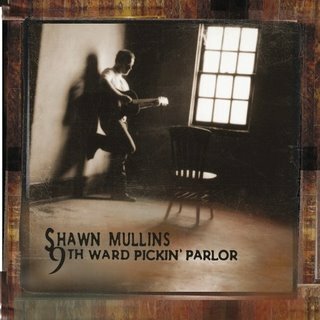 But back to the album of the week…9th Ward Pickin’ Parlor. The title suggests a New Orleans theme. Mullins hails from Decatur, Georgia outside of Atlanta. He attended college on an ROTC scholarship with an obligation of service after his graduation. He served in the IRR (Individual Ready Reserve) and acheived the rank of 1st Lieutenant but resigned honorably once his commitment was fulfilled. He has said that he has stayed in contact with a lot of the guys who he served with. The word that comes to mind when I listen to his music is “true.” A lot of people wrote him off because of the success of “Lullaby.” He’s continued to create spectacular music. His follow-up to Soul’s Core didn’t find commercial or critical success, and in 2002, he teamed up with Matthew Sweet and Pete Droge to form The Thorns. The Thorns made some noise on the scene not only bringing supergroup back into our vocabulary, but also echoes of Crosby Stills & Nash. With songs like “Faith” and “Beautiful Wreck,” 9th Ward has elements of blues, folk and rock. Definately check it out, the link below will take you to iTunes where you can hear samples of the songs. If you’re not an iTunes person, there’s an Amazon link at the bottom, as well. I think the Depeche Mode album was Violator. I think we also picked up Best of Boingo. The Thorns have a fairly bitchin cover of The Jayhawk’s Blue.